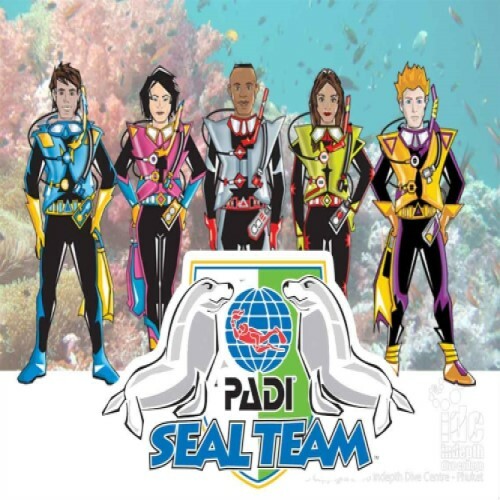 The PADI Seal Team is for our young customers from the age of 8, who want to learn to dive through completing exciting, action packed Aqua Missions in a pool. These missions integrate games with fun underwater activities whilst, at the same time teaching basic diving skills, under the direct supervision of our experienced PADI professional instructors. The Seal Team course gives the children a chance to do some cool stuff in the pool, meet new friends and share in the adventure of the underwater world. The best part of the PADI Seal Team Aqua Missions is they reinforce safe diving skills while the kids are having fun. PADI Seals get to sample a wide variety of dives. In addition, it provides parents with a structured program that lets their children develop skills, learn about the aquatic environment and have a lot of good, clean fun. This is also an excellent way to introduce kids to scuba diving prior to full Junior Open Water Diver Certification. The PADI Seal Team program is broken into two parts. Part one, Aqua Missions 1 - 5, teaches kids the basics of diving - things like buoyancy control, mask clearing, regulator recovery, etc. After building a solid foundation of scuba skills, kids move on to part two. Part two is full of Specialty Aqua Missions, which usually last about an hour. Calling all Seal Team recruits: The Seal Team crewpak includes everything a PADI Seal Team member needs to prepare for their Aqua Missions. Video on DVD? Check! Activity book? Check! Log book pages? Check! You are now cleared for an underwater adventure . . . Upon successful completion of the PADI Seal Team's five Aqua Missions, students become a PADI Seal Team member. They are then ready to start their next adventure and work towards becoming a PADI Master Seal Team member. At Flippas-n-Fins we run Monthly sessions at our pools. Your Youth Diver can start their AquaMissions on any session. At Queen Elizabeth Leisure Centre this is on the last Friday of every Month. Other pools vary, for instance Purbeck Leisure Centre is on a Saturday Lunchtime, but weeks can vary monthly due to pool avalibility. If your Student has never dived before we recommend that they undertake a PADI Bubblemaker session at £35.00 just to make sure!